The Epson ColorWorks C7500 series consists of 2 color label printers which are suitable for industrial needs. Outstanding performance meets rugged design. The C7500 series combines high speed and precision with durability. A truly advantageous solution for quality color printing. 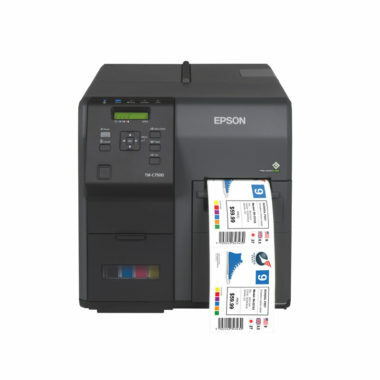 The ColorWorks C7500 series from Epson delivers color labels at an outstandingly high quality – the printers are ready for industrial environments and tough demands. There are two different models available; the C7500 for matte media and the C7500G for glossy media. The two printer versions use different kinds of ink. The high-performance printer series is especially suitable for the food and beverage sector as well as for manufacturing and other industrial sectors. Due to minimal maintenance requirements, downtimes are reduced to a minimum. Produce high-quality labels with the durable ColorWork C7500 series. The Epson ColorWorks C7500 series excels with high speed (300mm/sec). The printers are easy to use and easy to set up. The ColorWorks C7500 series by Epson offers on-demand label printing in full color for reliable and cost-effective label-printing.